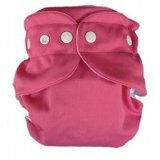 Stripping cloth diapers can be a simple solution to several issues that may arise with your cloth diapers. Your diapers don't seem to be as absorbent as they used to be. Build up of laundry detergent additives (especially fabric softener) on your diapers can reduce the absorbency of your diapers, and stripping your diapers is an easy solution to this problem. You are switching laundry detergents because your baby is getting a rash from your current detergent. If residue from the old detergent has built up on your diapers, just switching detergents may not be enough, and you'll need to strip your diapers to ensure all traces of the old detergent are removed. You have purchased used cloth diapers. Washing and striping used cloth diapers gives them a fresh, clean start for your own baby. Your diapers have an odor that won't go away after washing them. Stripping your diapers can eliminate problems with odors. Stripping cloth diapers is easy. Simply wash your cloth diapers for several cycles in very hot water without any detergent or other additives. You'll know you are finished when the final rinse water does not have bubbles when it is agitated. You must use very hot water to strip your diapers. If you've turned your water heater down for safety, you will probably need to turn it up - just remember to turn it back down when you're finished. Alternatively, you can add some boiling water to your washing machine to ensure the water is hot enough. Do not strip diapers that are dirty. If they are dirty, wash them first before stripping them. Check your diaper manufacturer's instructions before you strip your diapers to ensure you follow all of their washing and care recommendations. 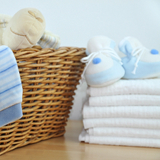 Avoid washing cloth diapers with detergent that has a lot of additives. Especially avoid cleaning cloth diapers with detergent that has fabric softener or fragrances. 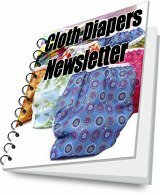 Avoid using dryer sheets when you dry your cloth diapers. The fabric softener on them causes build up. Adding 1/4 to 1/2 cup of distilled white vinegar to the final rinse cycle of your regular wash will help limit detergent buildup on your diapers. Avoid using too much detergent when you are washing cloth diapers. Approximately 1/2 cup should be enough. Diaper rash cream is very difficult to remove from cloth diapers. If your baby develops a rash, and you need to use diaper rash cream, consider using a diaper liner (while you are using the cream) so the cream does not come in contact with your cloth diapers. 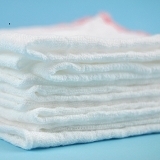 If you use washable liners, be sure to wash them separately from your diapers while you are using diaper rash cream so the cream doesn't transfer to the diapers in the wash.
Avoid diaper rash creams made from cod liver oil (or other fish oil) and look for diaper rash creams that have been designed specifically for use with cloth diapers.